The book, which was republished no less than 19 times before the outbreak of the Civil War, contains many of the Antebellum Era's most famous recipes--Gumbo, Chicken Pudding, Okra Soup, Curry of Catfish, Barbecued Shote, Field Peas, Apoquiniminc Cakes and more. It also reveals the customs of old Virginia, as well as preparation and serving instructions for a wide range of delicious meats, including lamb, mutton, pork, and poultry. 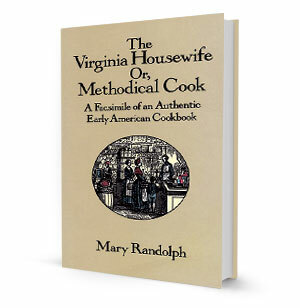 But Randolph knew much more than Southern cuisine; her book also includes recipes from England, France, Spain, New England, the West Indies and beyond. The Virginia Housewife offers a taste of early 19th-century cuisine few other cookbooks can serve up!